For both security & safety. Don't burn-out electronics ! SAVES ELECTRONICS from burnout ! Trickle charge. Performs 4 functions w/ built-in relays. Use to unlock doors w/ remote starter. Note: Automatic Transmissions Only. Performs 5 functions w/ built-in relays. Use to unlock/unlatch 2 doors, the trunk and window up & down. See more info. 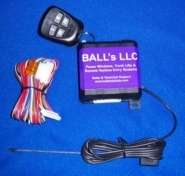 This 7-way remote control system comes already pre-mounted (plug n play) on a attractive composite board. Same functions as #07RMT. FREE Shipping on this item.